Should I Buy A Convertible Crib? Should I Invest to a Convertible Crib? We get asked many times whether it is worth the investment to purchase a convertible crib. The short answer is "Yes". Although a lot of customers are attracted to the look of a traditional crib; once they compare prices, customers realize they can get a convertible crib for the same price as a traditional crib and vise-versa, depending on style, detail work and manufacturer. If our customer is just starting a family and plans on using the crib in the "crib-stage" for multiple children, the value of having the ability to convert to a toddler bed and eventually a full-size bed becomes more appealing, especially considering the fact that all of their children will eventually need a bed, and this one has long been paid for. If a dresser (and perhaps chest) were purchased at the same, there is a whole bedroom group to grow with a child. Before convertible cribs were available, customers were forced to buy a crib and changing table piece, and then a few years later had to start over with new furniture. Now, not only do cribs convert to toddler and then full-size double beds, but dressers can accommodate trays and pads to be used as changing areas that come off to be used as regular dressers later. A few tips that help when choosing crib style are to keep in mind that the back of your crib will become the headboard of your child's full-size bed. Don't be afraid to ask what the conversion looks like. After all, your child will be in a bed much longer than he or she will be in a crib or even a toddler bed. Take into consideration whether you prefer a straight or curved top to your headboard, whether it be paneled, tufted, intricately detailed etc. There are many styles, textures and color choices available. Once you are ready to convert your crib, you have options as well. You can purchase a conversion kit, which allows you to use the front rail of your crib as the footboard of the full-size bed. You can also use a metal frame to support your box spring and mattress and use only your headboard. One item we highly recommend to protect your footboard while it is being used as a crib is a crib rail protector. It will protect from a teething baby (just in case) but also a zipper or belt buckle as parents are leaning into the crib. This will keep your footboard looking new for the adult bed stage. Crib rail protectors can be simple and inexpensive, or elaborate and a beautiful focal piece in the nursery. They can even be personalized with names or initials to add a special touch. 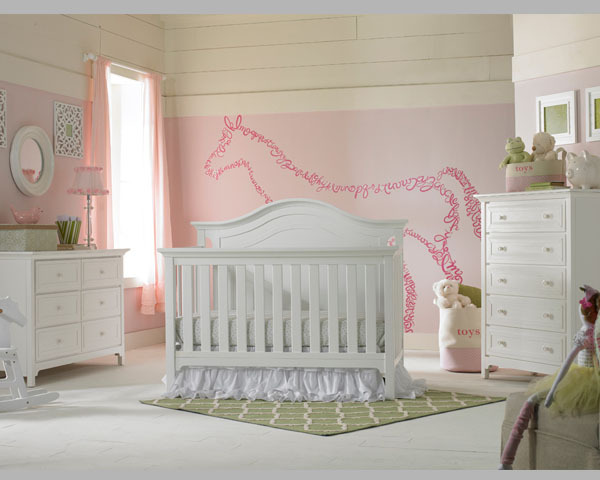 All of these choices can be overwhelming in the beginning, but with suggestions and planning, we can help you decide what will work for you to make the nursery of your dreams as well as get your child's room on it's way to transition from baby to toddler and throughout their teen years!